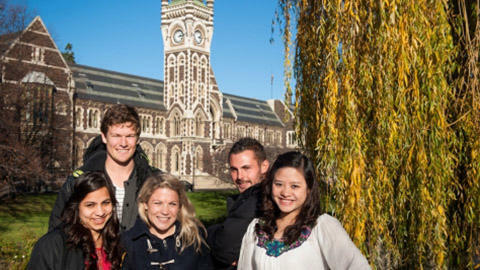 Welcome to the University of Otago – New Zealand’s first university and the first choice of more than 20,000 students. After almost 150 years, we’re still leading the way when it comes to world-class teaching and a legendary student lifestyle – the two core elements that set the University of Otago apart, and the reason students from across the country and around the world choose us for their tertiary education. In the 2017 QS World Rankings, Otago ranked 151st and is in the top 3% of universities in the world. We are New Zealand’s leading postgraduate research university and have earned an international reputation for the quality of our research and training. Most study takes place at our campus in Dunedin, a safe city where education is the main activity. Recognised as one of the 15 most beautiful campuses in the world (Huffington Post 2013), Dunedin is the only true university city in New Zealand and Australia. As a world-class teaching and research University, Otago offers a first-class education across more than 195 undergraduate and postgraduate programmes in Business, Health Sciences, Humanities and Sciences. We offer more than 195 undergraduate and postgraduate programmes. In the 2018 QS World Rankings, Otago placed in the top 50 Universities worldwide in the five subject areas of Physical Education, Dentistry, Archaeology, Anatomy and Physiology, and Development Studies. A further 10 subjects areas ranked between 51st and 100th being Theology, Nursing, Pharmacy/Pharmacology, Earth (and Marine) Sciences, Psychology, Performing Arts, Geography, Education, Anthropology, and Law. Otago also has another seven subjects in the top 150-band, and six in the 151 to 200 band. We are home to New Zealand’s first medical school and New Zealand’s only Schools of Dentistry and Surveying. Our internationally accredited Business School is an Asia-Pacific leader in education and research, and Otago secured top 100 faculty QS rankings for social sciences and management, and for arts and humanities. The University of Otago has high quality services and facilities to complement the wide variety of courses it offers. The International Office is a focal point for international students at Otago. The Office provides information, support and advice to future and current international students and to students wishing to study overseas on exchange programmes. It runs on-campus orientation programmes for new students, operates the International Mentor programme and Language Match, and offers a visa renewal service, and assistance with insurance and US Financial Aid.